I pretty much said all I have to say about this issue in my previous post since this book is a continuation of that story and nothing much happens here to redeem it. There is a profile of writer Frank Robbins at the end of the comic, but it pretty much carries on in the same vein as the issue itself which, again, is unfortunate. One thing that I didn’t mention before is that, almost as if they wanted to make the post Carmine issues as jarring as possible, there’s even a new letterer on the book. Which brings me to Gaspar Saladino the letterer of the early Silver Age Flash run. Even as a twelve-year-old kid, I could appreciate the fact that his lettering was truly something special that it was a part of what made those early books so special. It perfectly complimented Carmine’s futuristic art. 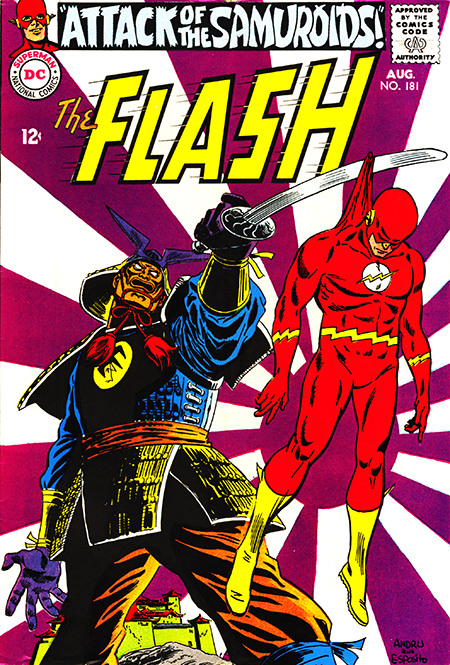 I realize that my love for those early Flash issues colors my thinking on all aspects of the book, but, even given that, I still realized that Saladino’s elegant lettering was a cut far above the rest. So, apparently, did Julius Schwartz. According to Mark Evanier, in a memorial in Alter Ego, Schwartz turned down Saladino’s art portfolio, but kept him on for his lettering. With Carmine Infantino’s move into management, Saladino became the companies chief cover letterer and logo designer along with work on those tantalizing I’ve-got-to-get-my-hands-on-that-book DC in-house ads. That and the fact that he moved over to the Batman titles with Schwartz no doubt explains his absence in this Flash issue. Gaspar Saladino passed away in 2016, and, with that, another star in the Flash firmament blinked out.